You wouldn’t think it from her supermodel looks, but Lorraine Pascale is a real fattie. She says she could eat this pudding all in one go by herself. Six of us struggled to get through half of it, so she must have a hefty appetite for such a slim girl. 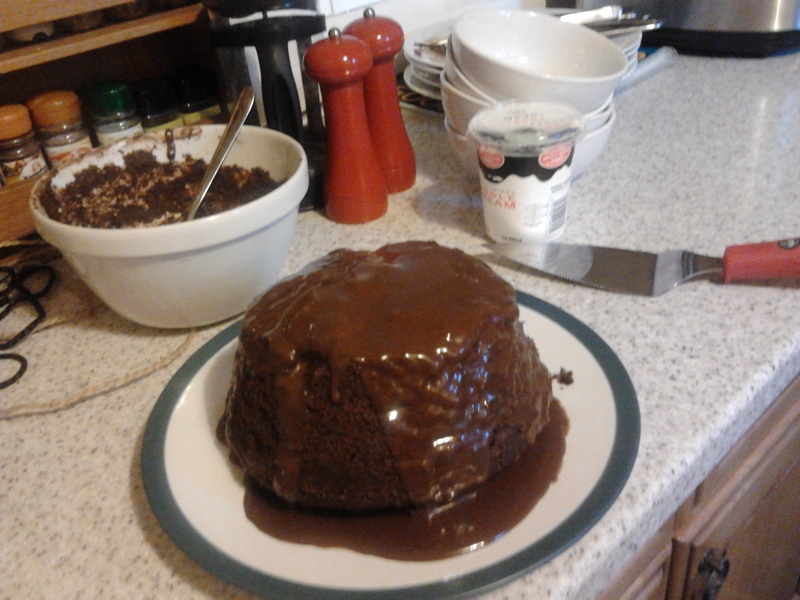 This pudding fills a 1.5 litre pudding dish. 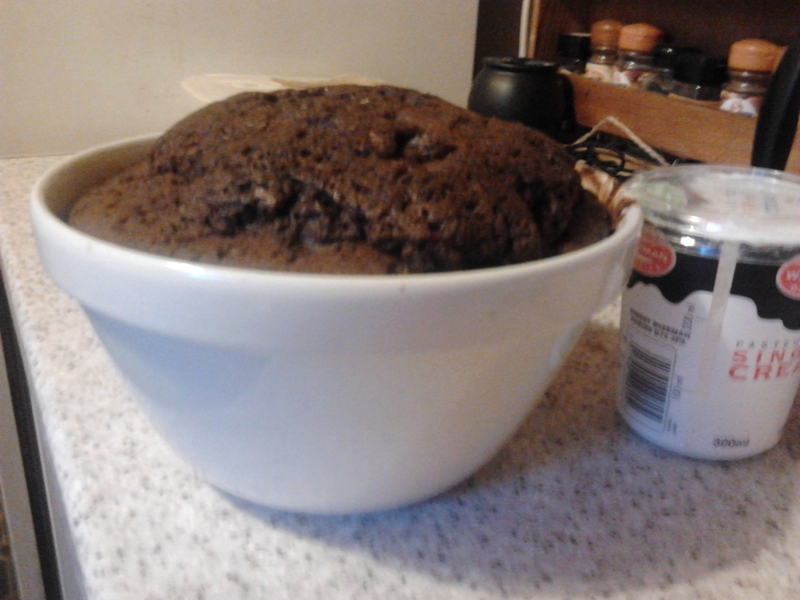 I am rubbish at visualising volumes like that, but it’s proper Christmas pudding sized. The pudding is a sponge with cocoa powder. I’m afraid I couldn’t find anything similar on the internet (Lorraine has 5 eggs and everyone else seemed to use 1 or 2) so you’ll just have to go out and buy the book! The Mars bar sauce is supposed to be just 5 Mars bars and some butter melted together, but I had to add some hot water to make it liquid enough to flow. You put some of the sauce in the bottom of the basin and put the sponge mix on top. Reserve the rest of the sauce for serving. Then, as all Lorraine recipes are quick and easy, you make a fiddly lid and handle for the pudding from foil and string (I couldn’t find any string for ages, and thought I might have to make do with a shoelace!) and steam the pudding on the hob for 1.5 hours, checking the level of the water regularly. The pudding was in no way cooked after 1.5 hours, but the diners were ready and waiting, so I shoved it in the microwave to finish off (after removing the foil, obviously). It rose up loads out of the basin, which was exciting! So maybe I should have chopped off the bottom to make it sit flat, but I didn’t. Here is the finished article. I served it with cream or creme fraiche. The pudding is rich and the sauce very sweet so the creme fraiche is nice to cut through it a bit. But the boys went for cream anyway. The pudding is incredibly moist and delicious. It was a hit with everybody and we sort of wished we’d eaten less for main course so that we could eat more pudding. But I’m still not sure I could ever manage the whole thing in one sitting!